They visited the Institute on August 5 to learn the techniques of cultural and artistic development in Japan. After they paid a courtesy call to Mr. Kamei, the Director General of our Institute, Mr. Miyata, the Director of the Department of Intangible Cultural Heritage, provided explanations on the work contents of the Department and answered their questions. As part of the training sessions for new staff of National Institutes for Cultural Heritage, 17 members visited the National Research Institute for Cultural Properties, Tokyo on July 21 and 19 members visited on July 22. They toured the chemical laboratory of the Center for Conservation Science and Restoration Techniques on the fourth floor, the Library of the Department of Research Programming on the second floor, the X-ray Room of the Center for Conservation Science and Restoration Techniques, and the Audio-Visual Documentation Section of the Department of Intangible Cultural Heritage on the basement floor. Those in charge of each facility provided explanations and answered questions. The students visited the Institute on July 26 to learn about the current status of scientific research on art objects and such like. 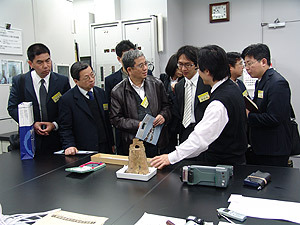 They toured the chemical laboratory of the Center for Conservation Science and Restoration Techniques and the Japan Center for International Cooperation in Conservation on the fourth floor, the Library of the Department of Research Programming on the second floor, and the Audio-Visual Documentation Section of the Department of Intangible Cultural Heritage on the basement floor. Those in charge of each facility provided explanations and answered questions. 1. Both Institutes have achieved sufficient results in the fundamental research on cultural properties including the research on intangible cultural heritage, and the advanced and developmental research on conservation and restoration, thereby contributing to national administration for cultural properties. 2. The Institutes are energetically involved in international cooperation for the protection of cultural properties in East Asian areas and West Asia. The Institute researchers are requested to make efforts so that the fruits of their activities are widely made known to the people of Japan and partner countries. 3. Individual investigation research projects have produced many excellent results, and they should be made known to people in a way that is easier for the general public to understand and also in an integrally summarized manner. 4. 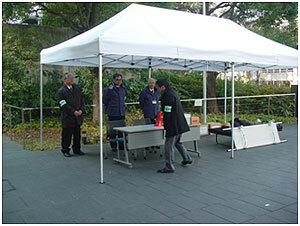 The researchers are requested to actively tackle research transcending sections or genres, research that is collaboratively conducted by both the Tokyo and Nara Institutes, joint research of cultural property institutes and museums, and research making use of the characteristics of independent administrative institutions. We also received a great number of other opinions. We will use the results of the self-evaluation and opinions of the Evaluation Committee members in planning future activities and improving corporative management. 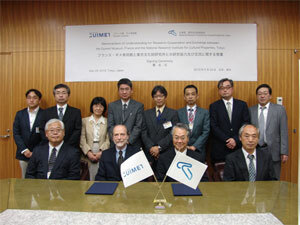 On May 24, 2010, a memorandum on cooperation in research and exchange was concluded between the Guimet Museum in France and the National Research Institute for Cultural Properties, Tokyo. The purpose of this memorandum is to strengthen and promote cooperation in research and exchange on the investigation, research, conservation and restoration of cultural properties for the Guimet Museum and the Institute. This will be achieved by exchanging researchers, jointly conducting academic activities, jointly holding symposiums and swapping scientific data. On that day, we welcomed Mr. Jacques Giès and Ms. Omoto, the Director and the counsel of Guimet Museum, to the Institute, and had a signature ceremony, where Mr. Jacques Giès and Mr. Kamei, the Director General of the Institute, signed the memorandum in the presence of staff members of the Institute. I took over the director’s duties from my predecessor Mr. Suzuki Norio and assumed the post of Director General in April 1, 2010. The National Research Institute for Cultural Properties, Tokyo has a long history spanning 80 years, including the years of the antecedent art research institute, and stores an enormous amount of data on cultural property research amassed by our senior staff. These data are valuable assets of the Institute and form the foundation of research on cultural properties that supports the present-day administration for cultural properties. In the middle of the recent administrative and financial reform, the National Research Institute for Cultural Properties, Tokyo is positioned as one facility of the National Institute for Cultural Heritage which consists of four national museums and two research institutes. 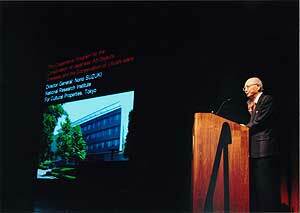 In spite of the changes accompanying the reform, the National Research Institute for Cultural Properties, Tokyo has a firm foundation that the precedent Director General Mr. Suzuki took the lead in building. This foundation includes the systematization of investigation and research of cultural properties, the unification and systematization of development in conservation and restoration techniques, and sharing of data on cultural properties. I will take over this firm foundation, further develop it, and do my utmost to accomplish the social mission that was given to the Institute. Recently, there have been demands for active links with the community and disclosure of information in a variety of fields, and approaches to open up organizations are being taken. Although research on cultural properties is apt to be specialized and difficult, I believe investigation and research for protecting cultural properties includes giving guidance to get as many people as possible to realize the importance of and cooperate in conservation. Therefore, when we make public the stored data on cultural properties and research achievements, we regard it crucial to convey them in an easy to understand way. The Institute does not have a sufficient number of researchers, but there are many researchers with abilities that can be used overseas, and their research activities are highly rated both in Japan and abroad. We all do our utmost to protect cultural properties so that our Institute can play a central role domestically and internationally. Your ongoing support and cooperation would be greatly appreciated. 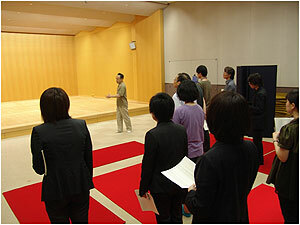 On April 22, they visited the National Research Institute for Cultural Properties, Tokyo to inspect the advanced facilities for protecting national heritage in Japan. They toured the Audio-Visual Documentation Section of the Department of Intangible Cultural Heritage on the basement floor, the Restoration Studio of the Center for Conservation Science and Restoration Techniques on the third floor, the chemical laboratory of the Center for Conservation Science and Restoration Techniques and the Japan Center for International Cooperation in Conservation on the fourth floor. Those in charge of each facility provided explanations and answered questions. On February 8, people related to domestic committees for UNESCO in China, South Korea, Thailand, Cambodia and Malaysia were invited by a training project hosted by the Japanese National Commission and visited the Institute to inspect our activities concerning intangible cultural heritages. 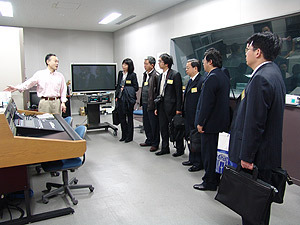 They toured the Audio-Visual Documentation Section of the Department of Intangible Cultural Heritage on the basement floor, the Japan Center for International Cooperation in Conservation on the fourth floor, the Library of the Department of Research Programming on the second floor, and the Special Exhibition in the lobby of the first floor. Those in charge of each facility provided explanations and answered questions. An integrated firefighting drill was conducted at the Institute starting at 10:30 a.m. on January 25. The simulated fire started in the hot-water service room on the third floor of the Institute. Training included early extinguishing, fire reporting, evacuation guidance, and first-aid, centering on the in-house firefighting team comprised of Institute members. 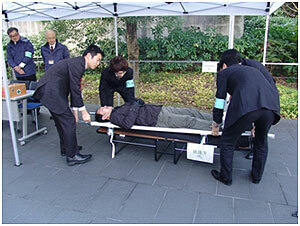 In addition, many staff members who were at the Institute on the day participated in the drill. At 10:30 a.m., the fire alarms went off, and the message “A fire has broken out. Please evacuate!” was broadcasted. The in-house firefighting team and the person who detected the fire used fire extinguishers to simulate fast extinguishing, and simulated a call to 119. The staff was guided outside, and evacuated the premises. At the same time, in addition to setting up a firefighting head office and first-aid station, the in-house firefighting team evacuated one trapped member who became sick inhaling smoke on a stretcher, and carried out important cultural items (simulation). Following this, a demonstration on how to use the automated external defibrillators (AEDs) installed in the Institute was held, and training on proper AED use was carried out. 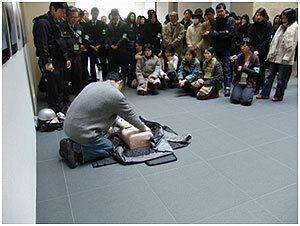 Participants carefully operated the AED, showing high interest in the importance of life-saving measures. 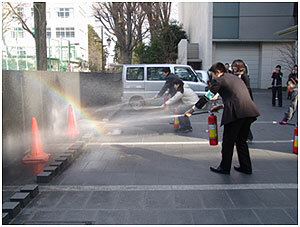 The Institute has a yearly fire drill in association with its “Fire Prevention Day for Cultural Properties” held on January 26. On December 1, three Mongolian trainees visited the Institute to view the operations and facilities, as part of their training. They were invited by the project hosted by the Cultural Heritage Protection Cooperation Office of ACCU (Asia/Pacific Cultural Centre for UNESCO) under the title of “Training 2009 for Cultural Heritage Protection (personal training for Mongolian) hosted jointly by the Agency for Cultural Affairs and the National Research Institutes for Cultural Properties, Tokyo and Nara”. They toured the Japan Center for International Cooperation in Conservation and the chemical laboratory of the Center for Conservation Science and Restoration Techniques on the fourth floor, the Metal work restoration studio of the Center for Conservation Science and Restoration Techniques on the third floor, the Library of Department of Research Programming on the second floor, and the Audio-Visual Documentation Section of the Department of Intangible Cultural Heritage on the basement floor. Those in charge of each facility provided explanations and answered questions. Suzuki Norio giving a presentation. 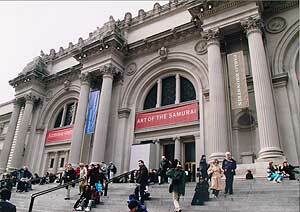 The exhibition “Art of the Samurai — Japanese Arms and Armor, 1156–1868” was held at the Metropolitan Museum of Art (referred to as “Met” hereafter) in the United States from October 21, 2009 to January 10, 2010. Masterpieces of Japanese arms and armor from ancient times to the modern age were exhibited. The exhibition proved very popular not only with people from the US but also with people from countries all over the world, and no less than 300,000 people visited the exhibition during these three months. This exhibition also displayed swords, armors, saddles, quivers, and other pieces owned by the Met that were restored in the “Cooperative Program for the Conservation of Japanese Art Objects Overseas,” conducted by the National Research Institute for Cultural Properties, Tokyo. 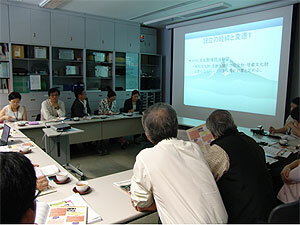 At the symposium held under the title “The Sunday at the Met” (November 8, 2009), which was related to the restoration of Japanese cultural properties, we had some presentations as follows. Mr. Ogawa Morihiro from the Met, responsible for the exhibition, explained the exhibition and the handling of swords, and Mr. Victor Harris, the former Keeper at the Department of Japanese Antiquities at the British Museum in the UK, gave a presentation on Japanese swords and their beauty. Mr. Fujishiro Okisato and his son Tatsuya, Japanese sword polishers, demonstrated how to polish a Japanese sword and gave some explanations. In addition, I presented an overview of efforts to conserve Japanese works of art in foreign collections and the philosophy and principles of restoring Urushi art objects in Japan. Over 700 people participated in this symposium, not only from the US but also from countries all over the world, which greatly surprised those connected with holding the exhibition — it was the first time such an enormous number of people had come to the Met since its founding. 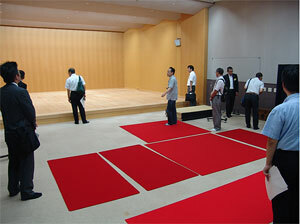 On the following day, a program called “The Scholars’ Day” (November 9) was held in the exhibition hall. 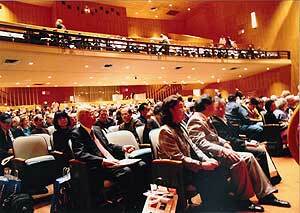 It targeted restoration specialists and curators all over the US, and similar presentations were made. These days there is concern that the amount of research being done in the US on Japanese art and culture is falling, and that Japan’s presence in this respect is dwindling. So I feel this exhibition at the Met was revolutionary as an attempt to stimulate and develop such research. 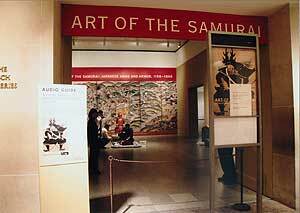 I pay my heartfelt respects and gratitude to Mr. Ogawa Morihiro, the special consultant on Japanese arms and armor at the Met, who spent over 10 years planning and executing this exhibition, and made enormous contributions to international exchange and the spread of Japanese culture and art, and to the Met. On November 6, the 20 students visited the Institute from the courses for staff in charge of cultural properties administration in education boards of local governments hosted by the Agency for Cultural Affairs, in order to enhance the qualities of the staff in charge by viewing the cultural properties restoration site. After listening to an overview given by Mr. Ide of the Planning and Liaison Section, they toured the chemical laboratory of the Center for Conservation Science and Restoration Techniques on the fourth floor, the Restoration Studio of the Center for Conservation Science and Restoration Techniques on the third floor, and the Library on the second floor. Those in charge of each facility provided explanations and answered questions. Seven students from Taito City’s Okachimachitaito Junior High School On September 8, the students visited under the “Learning by Workplace Visit” program, intended to teach them about jobs at the Institute and the importance of working. 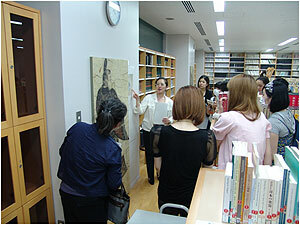 An overview was given by Deputy Director General Nakano, after which the students toured the Japan Center for International Cooperation in Conservation on the fourth floor, the Library of the Department of Research Programming on the second floor, and the Audio-Visual Documentation Section of the Department of Intangible Cultural Heritage on the basement floor. Those in charge of each facility provided explanations and answered questions. On September 14, Director Nakano gave a letter of appreciation to President Sueharu Sato of Otsukakogei-shinsha Co., Ltd., for the donation of a set of glass dry plates and prints of swords which were brought to the Institute on August 10 (received by the Department of Research Programming). They had a friendly talk in the Director’s room on a variety of topics, including the conservation and restoration of cultural properties and cultural programs concerning the exhibitions of works of art. 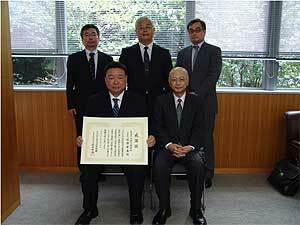 We are grateful for Otsukakogei-shinsha’s understanding of our institute and for their donation. We will employ the donation to further the business of the Institute. Four persons from Yamashita Sekkei Inc.
On August 10, four employees of Yamashita Sekkei Inc. visited the National Research Institute for Cultural Properties, Tokyo, to learn about how to design a cultural heritage conservation/research center overseas. They toured the Audio-Visual Documentation Section and X-Ray Photographing Room of the Department of Intangible Culture Heritage on the basement floor, the Restoration Studio of the Center for Conservation Science and Restoration Techniques on the third floor, and the Center’s Analytical Science Section on the fourth floor in order to learn about the survey and research previously conducted by the Institute. Those in charge of each facility provided explanations and answered questions. On August 20, Deputy Commissioner Goda and three other officials from the Agency for Cultural Affairs visited us to check on the current status of budget request items. We explained the surveys and research conducted by the National Research Institute for Cultural Properties, Tokyo, and gave summaries of our budget requests. Then they toured the chemical and biological laboratories of the Center for Conservation Science and Restoration Techniques on the fourth floor and the Center’s physical laboratory on the third floor. Those in charge of each facility provided explanations and answered questions.